Prominent & Leading Manufacturer from Mumbai, we offer bundy tubes. Double-Wall Steel Tubing that can be combined with an extensive range of corrosion- and abrasion-prevention coatings such as NyAl (aluminum and polyamide coating), NyZinc (zinc and polyamide coating), NyGal (Galfan and polyamide coating), PVF and many others. These tubes can also be provided with a polypropylene jacket to provide outstanding abrasion resistance. Single-Wall Steel Tubing with the same coating range as double-wall tubing but with the addition of a nickel-coated internal diameter to withstand the corrosive environment created by modern-day fuels. Multilayer Nylon Tubing with a range of permeation barriers and high-temperature capabilities. 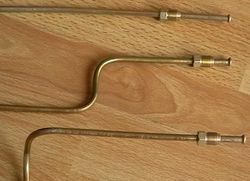 Easy-to-Assemble Quick Connectors that form an integral part of the overall fuel system through the use of spin welding joints. Sensor-Integrated Quick Connectors for functional integration, weight reduction and improved packaging. Heated Nylon Tubes for use in Selective Catalytic Reduction (SCR) systems for NOx reduction.